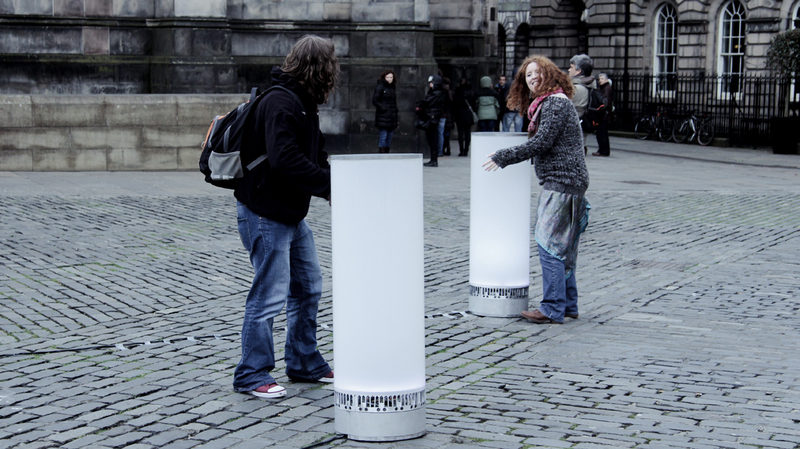 Tangible orchestra is an interactive installation that uses light and sound to create a playful experience. 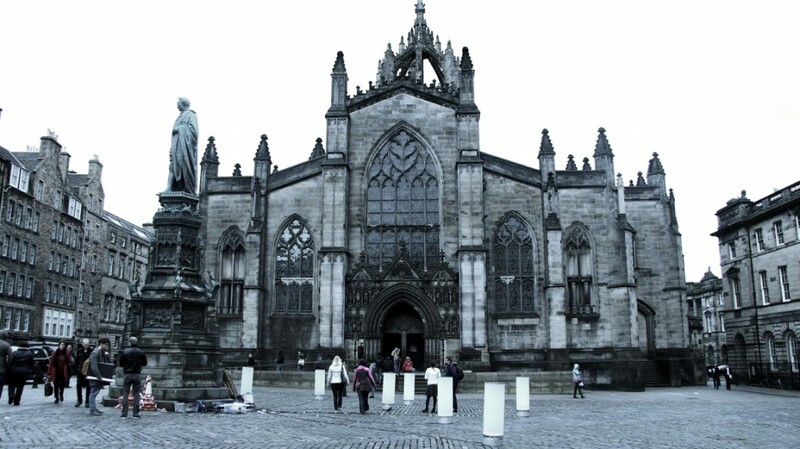 It was exhibited at Royal Mile, Edinburgh. 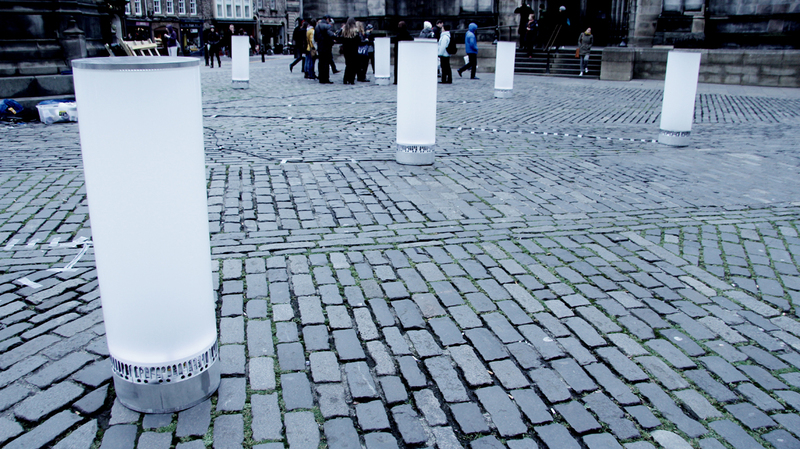 The installation comprises seven cylinders equipped with lights, loudspeakers and ultrasonic sensors. When a person approximates a cylinder, the latter will blink and reproduce the sound of a particular instrument. 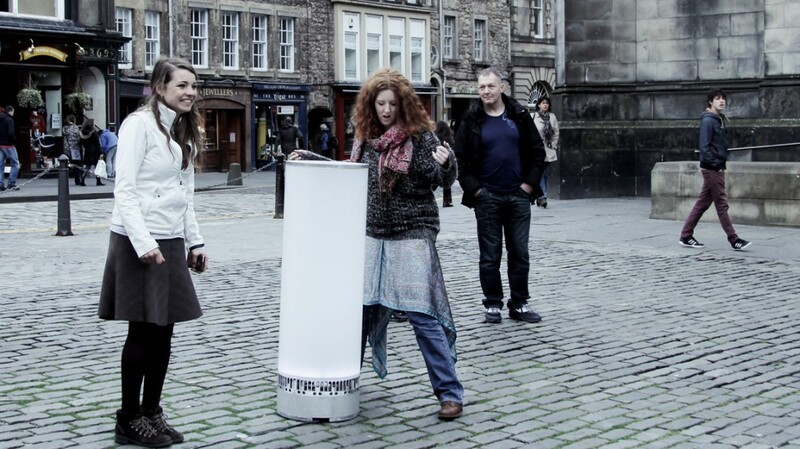 All together create an interactive musical composition that changes together with the movements of the spectators. The perception of each spectator is unique because the sounds reproduced by the cylinders will change depending on to the position of the person. This characteristic encourages the people to walk around, jump towards or even hug the cylinders. If enough people is engaging with the installation a complete musical work will be slowly assembled. To create the piece played by the tangible orchestra both electronic and classical orchestra instruments were used, creating interesting contrasts that fluctuate between electronic, repetitive rhythms and the melodies of classical instruments. For the realization of tangible orchestra the authors placed 16 ultrasonic sensors in each of the cylinders. This set up does not leave any blind spots and enables the detection of objects around the whole circumference. Every time a person approaches a cylinder, two or more sensors will be triggered. The data collected from the sensors is first sent to microprocessors inside of the cylinders and then sent to yet another microprocessor (an arduino mega) that coordinates the whole system. To create the light effects the authors use a processing sketch that uses the audio signals of each cylinder to blink the LEDs installed in each of the cylinders.